So, your doctor has recommended dry needling for your pain… It sounds horrifying, right? As a doctor of physical therapy who practices dry needling on a regular basis, I often wish I could have been there when they named the procedure. I’m sure we could have come up with something a little less… well, intimidating. It is what it is, though, so let’s explore the topic and perhaps you’ll find that it could be the pain relief treatment for you. Dry needling is a modern treatment designed to ease muscular pain. During dry needling, a physical therapist inserts several fine, short, stainless steel needles into “trigger points” in your muscle. 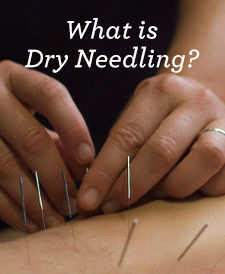 The process is known as “dry” needling because no medicine is injected. The needles are simply a method of intramuscular stimulation. These trigger points are areas of knotted or hard muscle – the originating point of an individual’s muscular or skeletal pain. The needle causes a tiny muscle spasm that signals the muscle to release the knot, relieving the pain or relaxing spasms. The needles will remain in your skin for a short period of time, typically between 10 and 30 minutes. A little, but likely not as much as the pain that you’ve been enduring. Every day, I treat individuals who have lived with horrific levels of pain, whether from accidents, disease, or overuse. They understand what true pain is, and they confirm to me that dry needling is not painful. Unfortunately, many of the practices used to relieve musculoskeletal pain aren’t exactly comfortable – think ice packs or that deep-tissue massage that about jolts you off the table. Dry needling is no different. The needles are very fine, so many people say that the muscular soreness is worse than the treatment. 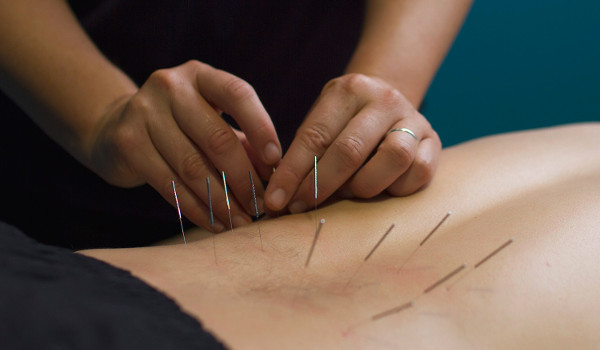 In many ways, dry needling and acupuncture are quite similar – both use thin, stainless-steel needles that are inserted into the skin to treat pain. That, however, is where the similarities end. Acupuncture is an ancient Chinese medicine practice that is designed to relieve pain by opening up a person’s chi or energy flow. This means that the needles are not typically placed exactly where the pain is, but rather into the body’s “energetic pathways” as defined by traditional Chinese medicine. Dry needling, on the other hand, is designed to stimulate the trigger points. The needles are inserted directly into the muscles and nerve pathways causing the pain. Pain is a very complex event that happens in the body, resulting from any number of antagonists. Therefore, we cannot simply say that dry needling will “fix” whatever is causing your pain. We can, however, tell you that dry needling has brought significant pain relief, and sometimes complete healing, too many of our patients, particularly when coupled with other healing and strengthening physical therapy methods. Only a thorough evaluation by a licensed physical therapist can determine whether dry needling could be a solution for you. Interested in learning more about dry needling, physical therapy, or other pain relief procedures? Call our office today!